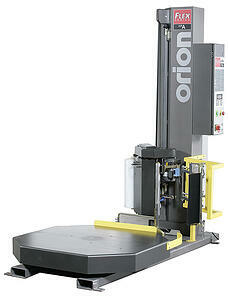 Orion's series of automatic stretch wrapping machines require no operator. 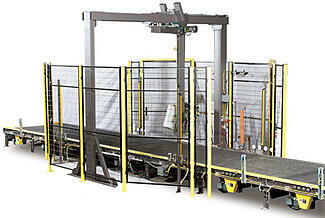 Once the load is brought to the machine, it is automatically wrapped to pre-programmed parameters. An operator is only needed to change the stretch film when the roll is empty, dramatically decreasing labour time. 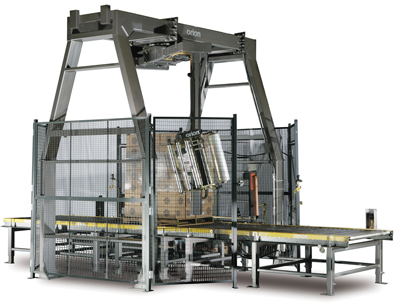 The Flex HPA performs the entire wrap cycle automatically, only requiring an operator to place the pallet load and pull the switch. 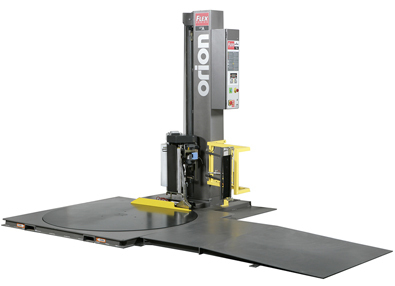 48" by 48" Turntable for Loads up to 50" by 50"
Similar to the HPA, the Flex LPA performs the entire wrap cycle automatically, only requiring an operator to place the pallet load and pull the switch. 63" Diameter Turntable for Loads up to 50" by 50"
The MA-ST machine is a fully automatic medium-heavy duty rotary tower conveyorized stretch wrapping system. It is excellent for medium duty production level applications requiring durability and reliability. The MA-DX machine has a long list of desirable features at price that won't break the budget. 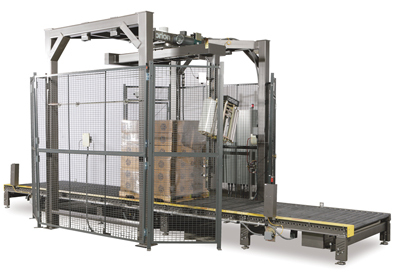 It features a film delivery system that faces the side for easier film loading and threading. This system allows for the fastest, easiest, and safest film loading on the market. The MA-X is a top of the line rotary tower in terms of speed, weight capacity, and features. It is excellent for high production level applications which demand maximum speed, efficiency, and long term durability. 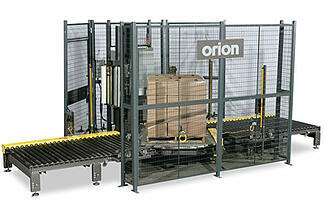 The Orion FA offers full surround 8 foot high steel mesh fencing. This machine uses the MicroLogix 1400 controller from Allen Bradley with a 6" colour HMI operator panel. AC motors with VFD drives insure high reliability and low maintenance. The frame is built from 100% structural and plate steel for maximum durability. The maximum weight capacity of the Orion FA is 4,000 lbs. with a conveyor speed of 30 feet per minute. The FA also has a soft start and stop feature to prevent load displacement.